Larry’s grandson Eric Lamond shares what it was like to grow up and work with the comedy trio. Photos courtesy of www.c3entertainment.com. The Three Stooges® is a registered trademark of C3 Entertainment Inc.
For decades, Eric Lamond had a front-row seat to a cherished, long-gone Hollywood. His grandfather Larry Fine was one of the original Three Stooges, and his father was a top 10 disc jockey in Los Angeles and host of the Three Stooges comedies on KTTV. 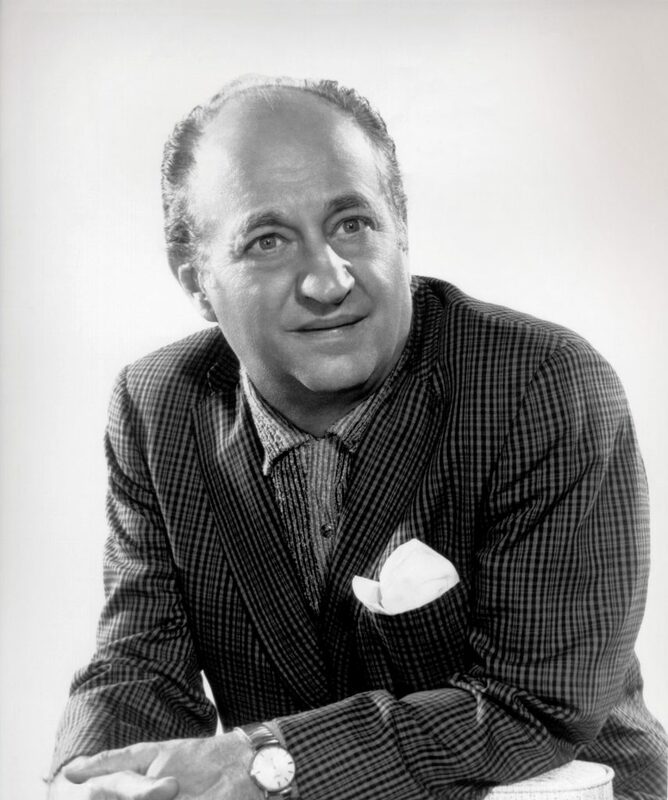 A FINE PHOTO A portrait of Larry Fine in his mid-50s. “He was my grandfather first and a member of the Three Stooges second,” Lamond says. For anyone who doesn’t know, the Stooges were Larry, Moe and Curly, a bumbling trio whose comedic escapades were punctuated by slaps, eye pokes and cream pies in the face. “Moe was kind of the leader of the pack and dished out the punishment. Curly did crazy stuff. If you really watch Larry, you could see him trying to keep the peace and reacting,” Lamond says. Larry Fine and Moe Howard were the mainstays of the trio. 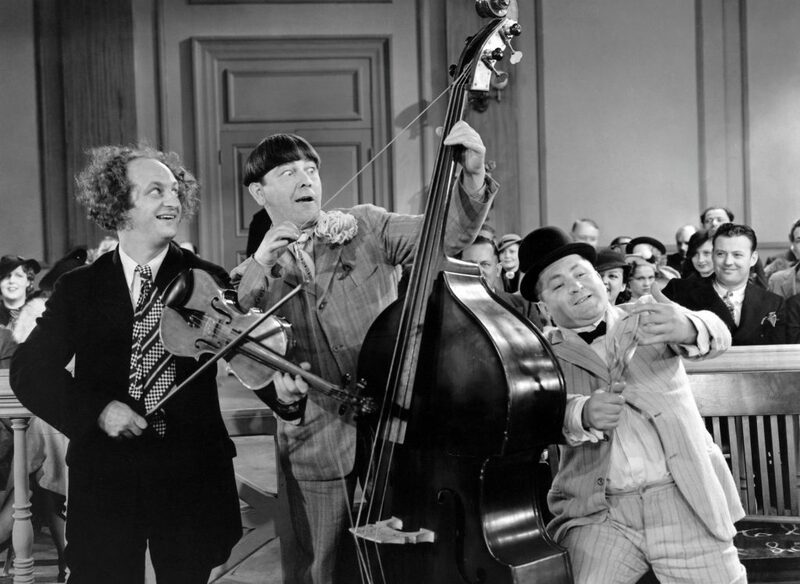 The third member was played at various times by Samuel (Shemp) Howard and Jerome (Curly) Howard — Moe’s brothers — as well as Joe Besser (Curly) and Joe DeRita (Curly Joe). 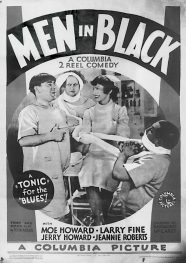 The group made slapstick and shtick an art beginning in the 1930s, and their comedic chops were recognized with an Academy Award nomination for Men in Black for Best Short Subject (Comedy) in 1935. With their 190 film shorts, live acts, cartoons and even a 2012 movie, the Three Stooges have entertained generation after generation. Despite Fine’s fame, “he was my grandfather first and a member of the Three Stooges second. So it was just the normal family interaction,” Lamond says. That interaction included frequent socializing with Moe’s family. “My dad was Larry’s son-in-law, and he and Norman Maurer, who was Moe’s son-in-law, did a lot of work together, mostly related to the Three Stooges and other stuff,” he says. “We didn’t live very far apart. They were up off of Vermont, above [Sunset] Boulevard. I grew up in Los Feliz Hills, on Commonwealth, above the Boulevard,” says the retired marketing executive, who now lives in Burbank. THE BOYS IN WHITE AND MEN IN BLACK The Stooges appear in a messy painting scene from Tassels in the Air and in a movie poster of Men in Black, their only film to receive an Oscar nomination. It was a parody of MGM’s Clark Gable movie Men in White. Lamond’s dad, Don, had another serendipitous Stooges connection. Don had been asked by KTTV, which was “owned by the L.A. Times back then,” to audition for a new television show. “A couple of weeks later, they call him, ‘Don, you’ve got the show. We’ll start in a couple of weeks, Monday through Friday, 7:30 to 8 at night. You’re going to be hosting the Three Stooges show.’ He had no idea what he was auditioning for, nor did they know that he was Larry’s son-in-law at the time,” Lamond points out. 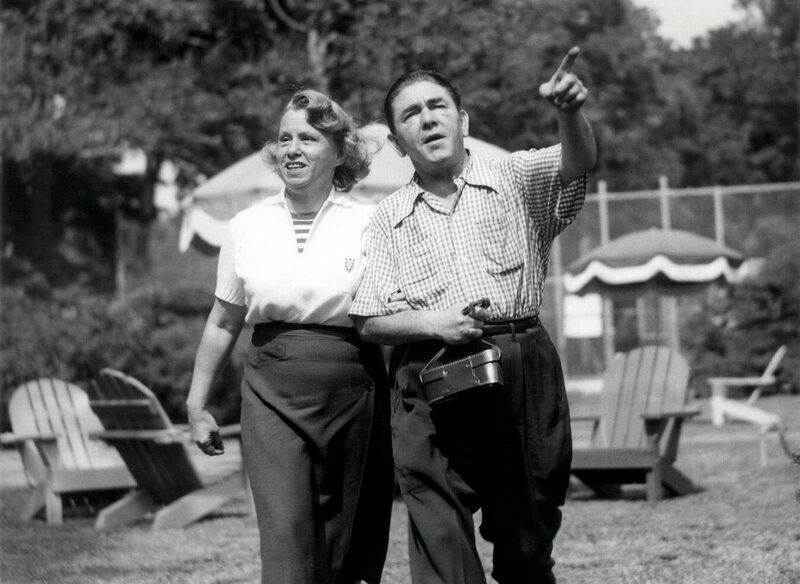 NO ILLUSION Moe with his wife, Helen, at an unknown location near their Toluca Lake home. Helen was a cousin of Harry Houdini. Family was a big deal for “all the guys — Moe, Curly Joe, Larry, Besser and Shemp — because they traveled a lot [for shows]. 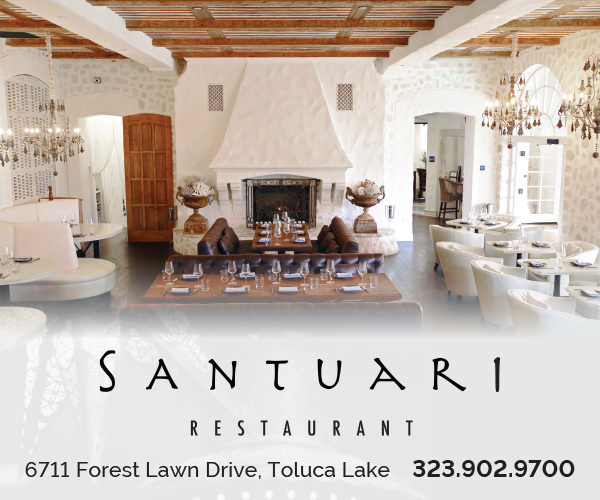 They were either working or doing something family related — running errands, hosting a party,” says Lamond, who vaguely remembers visiting Moe’s Toluca Lake home. For Lamond, life imitated art and work and family blended together once for 20 glorious, uproarious minutes in a performance he says no one else saw but him. “I can’t remember how old I was. My mom [Phyllis, daughter of Larry and Mabel Fine] and I went over to visit my grandparents. Larry had a very large home in Los Feliz Hills,” and he had received estimates from a contractor to redo the upstairs bathroom, Lamond begins. “Moe convinced Larry that he didn’t need a contractor, that they could do this. So they got all the material: new cabinetry, new fixtures, new tile and the wallpaper. Remember, this is back in the ’50s, so wallpapering back then was different. You laid the stuff out, you had the big brushes with the chemical treatment stuff,” he continues. “I’m up in the den — which has a clear view of the bathroom — to watch TV, and Moe and Larry come up and they’re in painter’s outfits and hats, and they’re in this huge bathroom. They’d done some of the prep work of the walls and they’re going to wallpaper. The sawhorses were laid out. The guys are standing side by side. Larry is going this way with the big brushes, and he rolls right over Moe’s hand. Without even looking up, Moe takes his wallpaper brush and, whap, hits Larry in the face with it. WHY, SOITENLY Jerome Howard, who portrayed Curly, with his grunts, squeals and “funny bits,” was a fan favorite. “They went right into character,” Lamond says, snapping his fingers. “It took them about 20 minutes to basically destroy everything. They did every Three Stooges bit you can imagine, the shtick, the slapstick, and just destroyed it. They’re laughing and they just kept going. It was better than any show I’d ever seen. It was hilarious,” he says, still chuckling at the memory. His mom and grandmother returned home. “God, to have had a camera,” Lamond says. Considering the eye pokes, hammer hits and hair-pulling Moe meted out on the shows, one might think that injuries on the set were common. Not really, Lamond says. 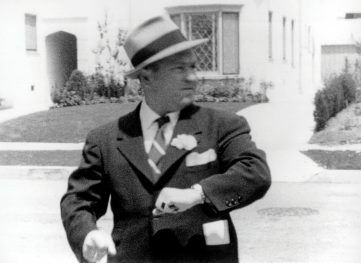 ROLE REVERSAL Onscreen, Moe Howard “dished out the punishment” as the lead Stooge. But offscreen, he, Larry and Curly were “normal family guys,” Eric Lamond says. 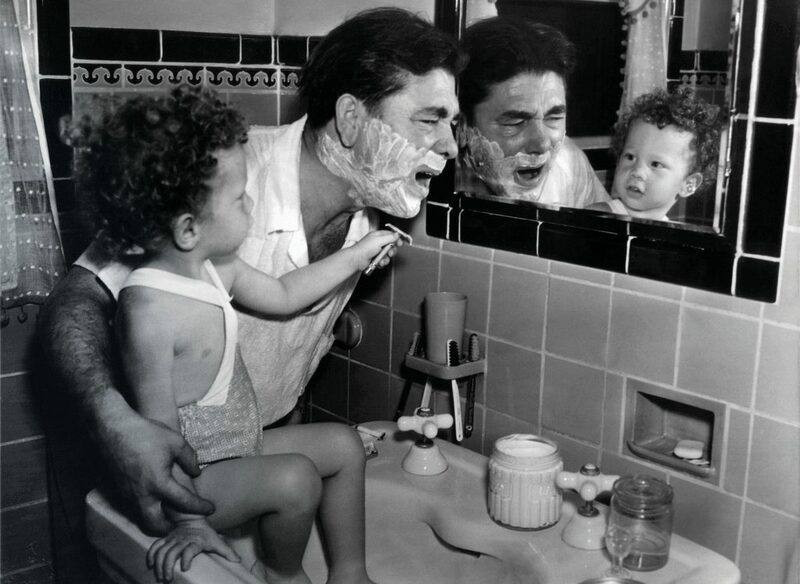 Here, Moe lets his son, Paul, wield the razor at their home in Toluca Lake. Sure, “there was the occasional injury. Moe broke a wrist filming a short. The table collapsed. He finished the scene, then went to the hospital. Larry lost a tooth,” he says. Curly “got clobbered” in a short where he falls down a dumbwaiter. Generations later, audiences still get the Stooges’ comedy. Maybe that’s why the trio is still revered for their crazy antics and why their popularity endures. The Stooges never stopped working, until Larry suffered a stroke in 1970 while filming Kook’s Tour. Unfortunately, it ended his career and what was to have been a new Stooges TV series. Fine died in 1975. Their form of comedy made casting for the 2012 movie The Three Stooges “a nightmare,” Lamond says. Nearly 600 people auditioned for the roles. 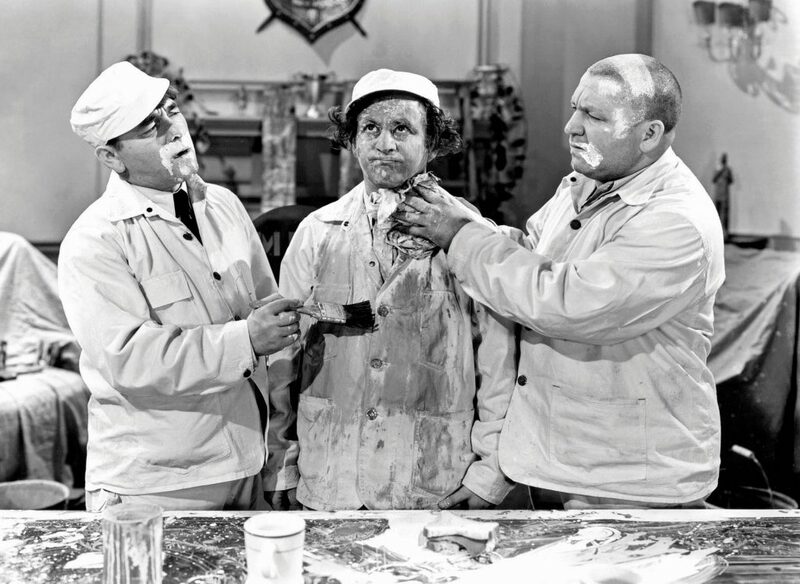 It was difficult to find three actors who could be easily identifiable as one of the Stooges and then “get the three of them to pull off the timing” critical to the boys’ brand of slapstick humor, he says. But they did, and another film script is in the works. MUSIC MAKERS OR TROUBLEMAKERS? The boys play a violin, bass and spoons in a scene from Disorder in the Court, which Lamond likes for its variety of elements. Offscreen, Larry was a gifted violinist, his grandson says. Larry “did some oddball things,” Lamond continues, adding that Larry had once invested in a company that made flocked wallpaper — for bathrooms. Plus, Larry had a “terrible gambling problem,” his grandson says. “Larry loved the track and he was a lot of fun to go to the track with. Everyone knew Larry. Yeah, he gambled a lot but he was a $2 bettor. A big loss for Larry at the track was $20,” he says. As an entity, the Stooges were way ahead of the game when it came to preserving and licensing their brand. They started their company, now called C3 Entertainment, in 1959, and it is owned and operated by the heirs of the Three Stooges. They include Moe’s two children and two grandsons, Larry’s five grandchildren, Besser’s niece, Shemp’s daughter and granddaughters, and DeRita’s two stepsons, who run C3. An official Stooges site, threestooges.com, and an online gift shop, shopknuckleheads.com, provide a constant digital presence. Everything from Three Stooges casino slot machines and Monopoly games to coffee mugs and T-shirts have been sold. Plus, every fall, the Alex Film Society pays homage to the comedians with its Three Stooges Film Festival at the Alex Theater in Glendale. This year’s double showings of six shorts are scheduled for November 24.